Our first tea/chai stop in India | Where to next? Indians love their chai (tea) and sweets. In fact, they love food in general. Every village has a chai stall or two. 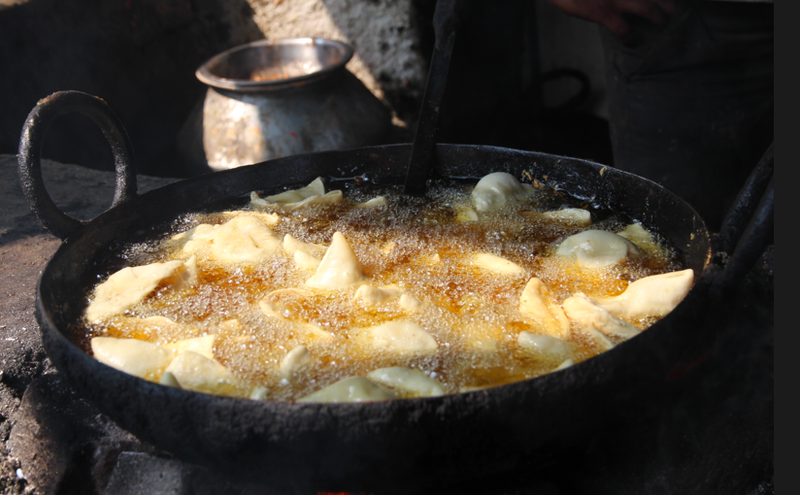 While most stalls are basic, open-air operations, many are fleshed out with a vast array of sweet and savoury temptations to go with a cup of sweet, milky tea. Our first chia stop came on the first morning of our overland journey. We’d had a good breakfast in Jabalpur, but by mid-morning our tummies were rumbling and grumbling. So Anand and Deepti pulled over in a small village and we hopped out to try some of the offerings. 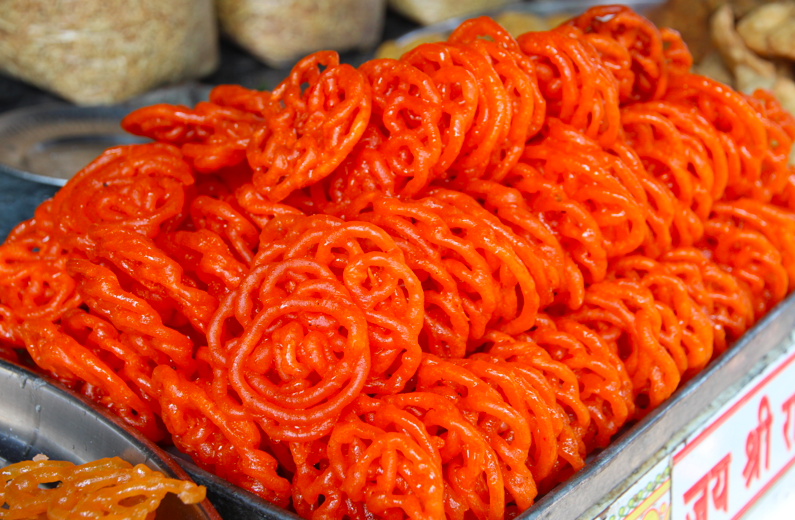 Jalebis are showy and give a great sugar hit. They’re doughy, orange, deep-fried and then put in a kind of sugar syrup. Makes them good and sticky. They look like giant pretzels. I should confess that I’m not a big sweet eater, but think that jalebis are quite tasty—in strict moderation—and very pretty. I think Australia supermarkets sell a make-it-yourself version of jalebis. I wonder whether I could colour them with red and green for Christmas? Probably—the shopkeeper was making some green and red concoctions to colour another treat. We tried the deep-fried samosas, sugary jalebis (just a taste), a few other sweet and savoury treats and, of course, the chai. Never got a pic of the chai this time. Too busy ogling at all the other treats. If you’re a sweet, or food, lover in general, be sure to check out my recipe blog. Thank you. Good luck with your ventures too. At least when everything is overly sweet it’s much easier to eat only a small amount. The jalebis do look yummy but I think you’d probably only be able to manage two or three before all that stickiness got to you. Beautiful photos as always though. Thank you. I think I managed about half of one. They are really, really sweet! Inviting beauty, play, mystery… Thank you. You are most welcome. Glad you like it.